GARDENERS will savour autumn in Victoria’s North East when ‘Wallasey-Beaumaris’ near Three Mile Creek, south of Beechworth, and ‘Varrich’, in nearby Stanley, open on Saturday, April 14 and Sunday, April 15, this year, for Open Gardens Victoria’s autumn season. The Beechworth garden, owned by Peter Kenyon and Jamie Kronborg, was first open under the stewardship of Helen Gordon in the second year of Victoria’s Gardens Scheme in 1988-90 and again the following season. It has not since been open in the Australian Open Gardens Scheme or its successor, Open Gardens Victoria. Varrich, on the edge of Stanley village, is owned by former Western District farmers Sally and David McKay and is opening as part of the OGV annual program for the first time. The entrance to the McKays’ cool climate garden – at an altitude of 800 metres – is a winding path through tall eucalypts which lead to a series of lawns planted with rhododendron, azalea, maple and camellia and informal borders with hellebore and perennials. A small dam and two small ponds are delightful water features. Beyond the house and garden is a large open area filled with maple, liquidambar, pin oak, tulip trees, chestnut and aspen. A bushfire bunker has been built by the McKays in the garden since the 2009 Black Saturday fires, which threatened Stanley. At ‘Wallasey-Beaumaris’, near Beechworth, a garden is thought to have been cultivated from the early 1860s when American brothers James and Patrick Ring took up a small parcel of land by Three Mile Creek and sought their fortune on the Ovens goldfield. The garden was variously cultivated and then neglected for long stretches before it was refurbished and extended from the late 1970s. SLOW TURN: Cyrilla racemiflora takes on its autumn cloak before losing its leaves while retaining the racemes of seed through winter. It had long been known as ‘Beaumaris’ – a Norman French name for the ‘marsh’ vista that remains below the garden drive. Today the legacies of refurbishment show in Berberis thunbergii ‘Fireglow’ and B. thunbergii var. atropurpurea – forms of Japanese barberry – which have become spectacular harbingers of winter, adding to what are thought to be the garden’s original assets: an old French perry pear, a towering specimen of Photinia beauverdiana var. notabilis – brought into cultivation from China by famed late nineteenth century plant hunter Ernest Wilson – and venerable loquat Eriobotrya japonica and mulberry Morus nigra. These, and later planting of a pair of Cyrilla racemiflora – the swamp titi or he-huckleberry, the sole species of a genus endemic in Louisiana and the Carolinas – are among the garden’s unusual trees and shrubs. The planting also includes numerous camellia species and varieties, which do so well in the Indigo hills, an alley of Manchurian pear Pyrus ussuriensis, weeping cherry, acer, amelanchier, berberis, birch, arbutus, clematis, mahonia, magnolia, roses and a grand example of cherry laurel Prunus laurocerasus – which often grows in country turned for gold. Since 2013 Peter Kenyon and Jamie Kronborg have worked to protect and maintain the garden’s heritage and aid its development. The main east-west axis below the house has been widened to align its delineating box hedging with a Manchurian pear alley to the west. 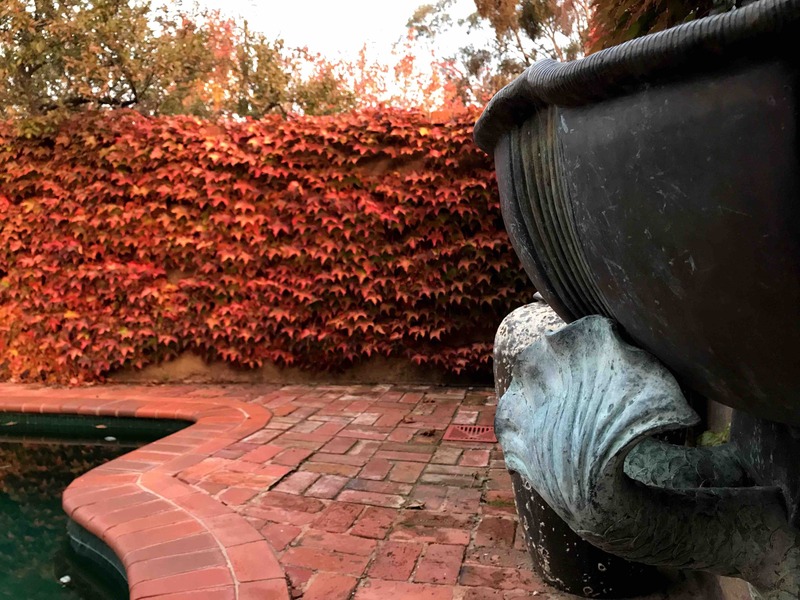 Large garden beds above the house terrace, faced with Beechworth granite, have been replanted and a new kitchen garden established beyond a swimming pool, where high, rendered walls are clothed in Boston ivy Parthenocissus tricuspidata – an arresting sight in autumn. A new orchard of about 40 heritage and newer varieties of apple, quince, pear, peach, cherry and citrus has been planted on the hillside north-east of the garden since 2014 and a simple maze cut in the mixed native grasses and introduced pasture of the paddock.